Round 2 of the freezing temps….Enough already!! Despite still being sick, it was a good, short week. 1. Reading a book with my class on the iPads = Amazing! Why didn’t I think of this sooner? 2. Laughing so hard at dinner the other night and Diet Coke coming out of Ian’s nose! (Did I mention we were in a restaurant!?) = Laughter IS the best medicine! 3. Dee qualifying for the District Spelling Bee and making the Power of the Pen Team! = Proud momma here! 4. Super cuddly puppy in a turtleneck! = Say Cheese! 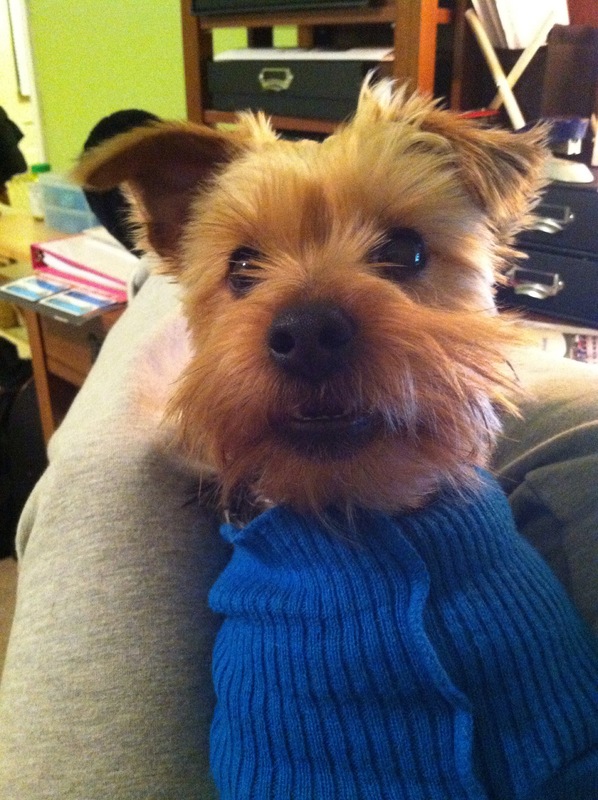 Blue Sporting a Blue Turtleneck! 5. This video I shared with Ian and Dee last night at dinner = I think their Valentine’s gifts are going to have a “Jelly Bean” theme this year!